The best thing you can do for your body in the throes of a sunless winter is to whip up a hearty casserole served up bubbling—straight out of the oven. There’s nothing more comforting than scooping out a hefty portion with the biggest serving spoon you can find and cuddling up on the couch with it. Plus, most casseroles take little effort to put together, and make for some of the best leftovers—a huge bonus when you’re planning ahead for a busy week. Thick slices of eggplant layered with gooey mozzarella cheese and homemade tomato sauce bring you the South of Italy with just one bite—and who couldn’t use a little Italian vacation every once in a while? A beautiful casserole with classic flavors, this is a great chance to use that shiny new mandoline you got for your birthday—but of course it can be done just as easily with a sharp knife. Eat it on its own or pair with a simply cooked, mild white fish like cod or snapper. 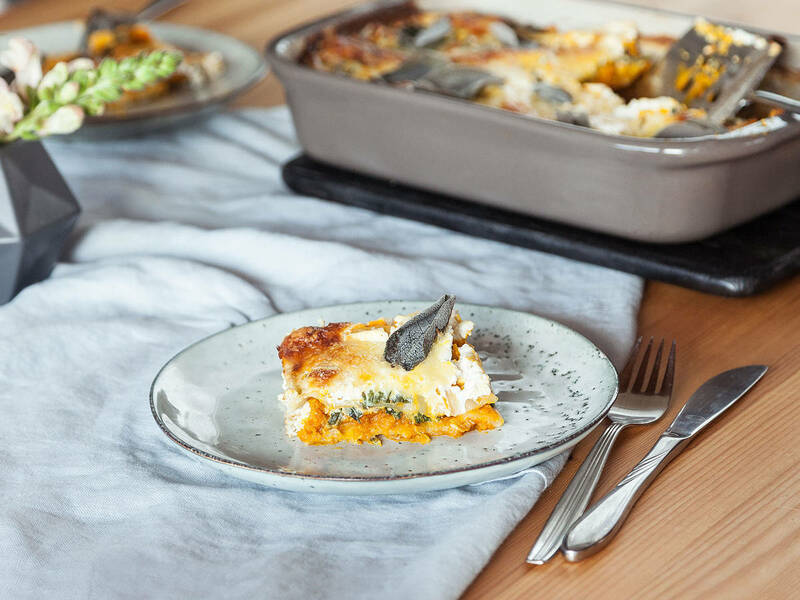 A cheese-less twist on the original, this lasagna is filled with our favorite earthy flavors: thyme, mushroom, and spinach. This is a great dish to keep in your back pocket whether you yourself are vegan, have friends that are, or simply want to impress those die-hard carnivores with a meal where they won’t even miss the meat. One of our easiest and most versatile casseroles, this is what we like to call a fridge-clearing dish. If you have extra vegetables in your fridge—carrots, fennel, or squash for example—chop them up and throw them in the mix too! A crowd-pleaser if there ever was one, this tortellini casserole comes together effortlessly, but more than delivers in the taste category. Use a combination of mild, melty cheeses like cheddar, mozzarella, and young Gouda for the gooiest outcome, but feel free to play around and mix it up with this foolproof recipe. A traditional eggplant- or potato-based dish from the Levant, Middle East, and Balkans, we’ve changed up the moussaka game with a vegan version that hits all the right notes. Packed with veggies and not short on flavor, you can swap out the tofu for tempeh for a different texture and flavor, or even try frying the tofu beforehand for added depth and an element of surprise. Looking for something exciting and different when it comes to your casseroles? Try this pumpkin and spinach lasagna with goat cheese, ricotta, and fresh mozzarella—a unique take on the dish you already know and love. The combination of carbs and cheese just can’t be beat, and this easy four-cheese and tomato baked penne is most definitely a winner. Kids and adults alike will love the crusty breadcrumb layer, making it a shoe-in for a niece’s birthday meal, friendly dinner party, or simply a weeknight meal at home. Creamy, cheesy, and leek-y (yes, we made this word up), a potato casserole for the ages is just a click away. The nutmeg and thyme play perfectly with the heavy cream and cheese, and the vegetarian sausages can just as easily be swapped out for another substitute or (meatier) protein of choice.